Lack of time…a common thing coming with having children. Finally found a moment and decided to post some recipe. Will try and do it on a more regular basis. 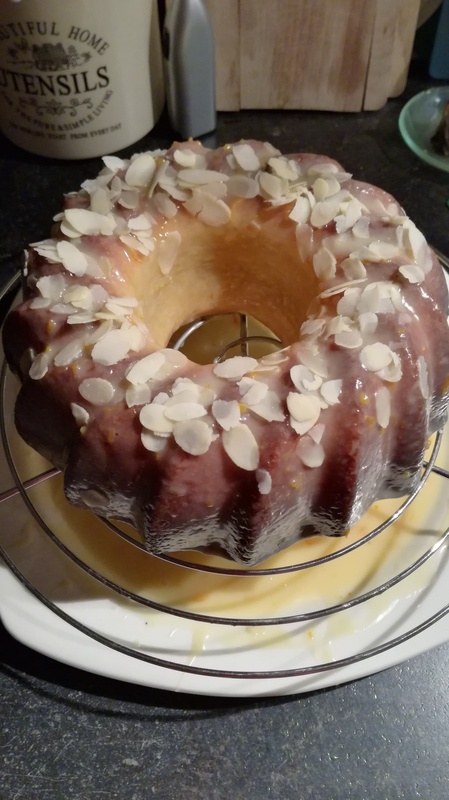 Today I propose an almond Bundt cake. Generally I am not a big fan of cakes like those. They mostly are too dry and too boring for my liking. This one is different and will get into my cake repertoire for sure. Polish people make those mostly for Easter. Original recipe comes from here. Enjoy! Prepare small baking Bundt pan, volume around 1.5 l. Coat it with butter and sprinkle with bread crumbs or ground almonds. Pre-heat the oven to 180°C. Put small pieces of chocolate and cut into small piece butter into a small bowl. Place the bowl above a pan with boiling water and mix until ingredients melt and mass becomes homogenous. Add sugar and egg yolks and then mix again. Take the bowl away from heat, add sifted flour, baking powder and ground almonds. Mix with a spoon. Whisk egg whites and combine it with chocolate batter. In the end add orange zest. Pour butter into a pan and bake around 35 minutes (check with a cake tester if it’s ready). Take the cake out of the oven, cool it down and place it on a cooling grid. Put pieces of white chocolate, cream and liquor/orange juice into a bowl. Melt it in a water bath (same as the chocolate for batter). Take it off the heat and wait for 1-2 hours until icing get denser. Decorate the cake with the icing, sprinkle some almonds or almond flakes on top of it.